Alternative energy sources exist, but there is a lack of awareness, distribution and skill in their use. NaDEET’s Response: At NaDEET Centre, children and adults learn about alternative energy equipment through first-hand experience and thereby gain knowledge, skills and confidence in their correct use. 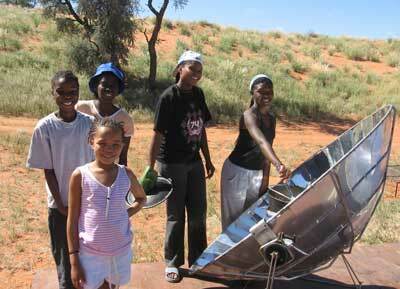 All food is prepared using parabolic solar cookers and solar ovens. These reflect the sun’s rays to create concentrated heat that is more than hot enough to cook. Participants learn how to correctly set up and adjust the cookers and ovens to maximise the sun’s energy. 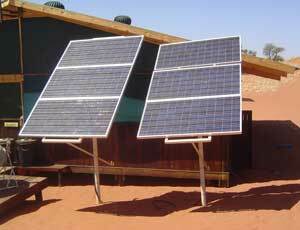 NaDEET’s electricity is generated by solar panels. These electricity for ample lights, fridge, freezer and electronic equipment for the classroom. Children supervise the energy consumption using an electricity monitor. Turn off the lights when they are not in use. Turn off stand-by lights on electronic equipment. Reduce the temperature on electrical water geysers and switch off when they are not in use. Invest in energy efficient appliances, solar cookers and solar water heaters. 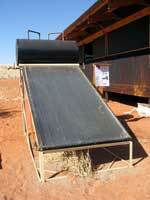 Hot water for washing dishes and bathing is created by solar water heaters. These use the sun’s energy to heat water through absorption, the greenhouse effect and proper insulation. In the mornings, fuel-efficient stoves are used to boil water using fire bricks made out of recycled paper. These stoves use less fuel by trapping the heat around the pot or kettle, therefore cooking is faster than over an open heat source. 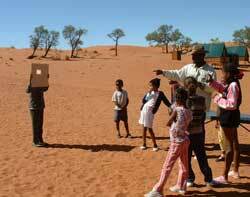 Simple scientific experiments are used to allow children to investigate basic principles of light and heat energy. These include absorption, reflection, conduction, insulation and bundling. These experiments develop the knowledge needed to correctly use the solar equipment at NaDEET Centre.